I was tagged by the amazing Jessica over at LuvMyLacquer. I Love doing these tags because it helps me tell you guys a bit more about myself. How many nail polishes do you have? Oh Boy! I don't have as much as most nail bloggers have, but I'm still scared to say how much I have because I have some friends and family members who read my blog. lol.. Ok, Ok, I know they're understanding, and they know this is my hobby, so I'm going to be honest and say I have a little over a hundred bottles. 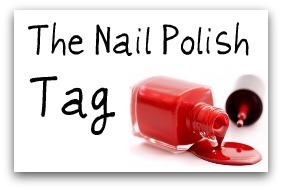 What is your favorite brand of nail polish? How can I possibly pick one? There are so many awesome polish brands out there, but I guess if you've been a regular reader of my blog, you probably would have noticed by now that I love Kleancolor polishes. I love it for it's variety of colors and extreme affordability. I am also in love with ZOYA polishes now that I have more of them. Do you like crackle polish, or do you hate it? Hate is a strong word, but I really, really, really, really don't like crackle polish. Lol.. I want to try Kleancolor crackle polishes though, I saw some swatches, and the finish is a lot nicer than most of these chunky crackles I see and have tried. What is your first nail polish brand? If I'm not mistaken, Sally Hensen was my first nail polish brand. If you're going to have a nail polish line, what are you gonna name it? Should I really say this? I don't want someone stealing my idea, because someday I just might have a nail polish line. Lol. If I do have one, it'll be called "Hot-Angel Nail Varnish". What nail polish color does not compliment you? Navy Blues don't really look well on me, I love them on other people and wish I can wear them. Name two of your best nail art friends? I would have to say Jessica and Stacy. Jessica is awesome with stamping polishes and does the most creative things with her plates. And Stacy is just amazing with freehand designs. What was the best nail polish gift you have ever received? This is a tie. First up is, the gift Ida sent me! Secondly, my mom went to the store this past weekend, and brought me back my first set of Color Club Polishes. These two gifts are special because Ida gave me my first polishes by BYS, my first glitters for frankening, plus some amazing nail art wheels; and my mom gave me my first polishes by Color Club. I love both so dearly. Make a speech about thanking the blogger who gave you this tag. Jessica tagged me, and I am so grateful to her. I met her on a group we're both in on facebook, and ever since then, we've been regulars on each others blog. She has gorgeously beautiful nails, and her swatches make you want to buy the polishes she uses. lol. She started blogging a few days after I started my blog, so I feel close to her in that aspect. She has done amazing things with her blog LuvMyLacquer and I look forward to more of her posts. I feel really blessed to have met such an amazing person because of nail polish. God Bless you so much! Well, that's it ladies. I had a great time answering these questions. Till later my dearies. Thanks for reading, God Bless. I'm so happy that you did this Lizzy & even happier that u consider me a friend as I do u! It's quite amazing how those pretty little bottles help in making beautiful relationships! Hot-Angel is a great name..i could only imagine what the collections will look like! & i think most of us started off with sally hansen =) God has blessed me in allowing me to meet you, xo!! Ore, Lol... *put head down*... I .. I don't know how it happened. The interesting thing, in nail blogging world, that's probably a little number. Jessica, :-) Thanks again for tagging me. And maybe, just maybe I'll start my own line of polishes. lol..
Sally Hensen was the best polish I owned before I really got into nails. lol.. they were cheap, and good.